Illinois and Indiana fifth wheel RV customers will find a ton of Sundance models at Phillips RV Sales! Sundance fifth wheel Recreational vehicles are a best-seller because they exceed industry expectations. Sundance is part of the Heartland recreational vehicle line, and this Chicago RV dealer has a ton in stock. 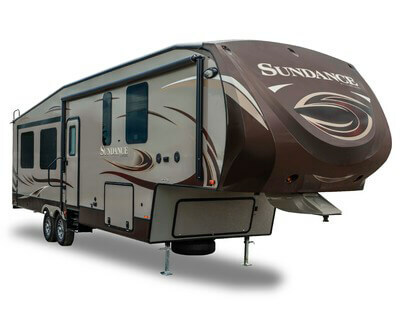 Sundance fifth wheels come with tons of floor plans, including SD 2880- RLT, SD 3000CK, SD 3000MK, SD 3270RES, SD 3300CK, SD 3310MKS, SD 3380RL, SD 3400QB, and SD 3600QB. Visit Phillips RV Sales to see the huge inventory of Sundance fifth wheel models we have in stock. Indiana and Illinois RV customers always note how great Sundance fifth wheel models look. The exterior exudes luxury, and the standard features give you exactly what you need. Standard features include a Universal Docking Center, E-Z Lube Hubs, Exterior Stereo Speakers, High End Graphics Package, Spare Tire, Outside Shower, Security Light, Forced Air Heated & Enclosed, Holding Tanks and Valves, Exterior Propane Quick Connect, Dual 30lb LP Tanks, Sewer Hose Storage in Bumper, Rear Ladder, Equa-Flex, Electric Power Awning, and much more. How safe and comfortable the interior of your motorhome is makes a huge difference. 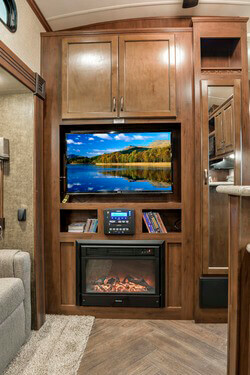 That is why Sundance fifth wheels come with Solid Surface Residential Counter Tops, Smoke Detector, LP Detector, Fire Extinguisher, 8ft Wide-Body Design, 78" Interior Height, monitor Panel, Cable TV, Ducted 13.5 A/C, 12V AM/FM/CD/DVD/MP3 Player, Glazed Chestnut Cabinets, TV Antenna with Booster, and a Hide-A-Bed Sofa. The kitchen is always where our Chicago area RV dealership finds people have the most questions about. Every fifth wheel comes with Solid Surface Counter tops, Glazed Chestnut Cabinetry, Larger Overhead Cabinets, Large Stainless Steel Kitchen Sink, Hi-Rise Kitchen Faucet, Beauflor Residential Flooring, Power Range Hood with Light, and an 8 cubic foot Refrigerator. 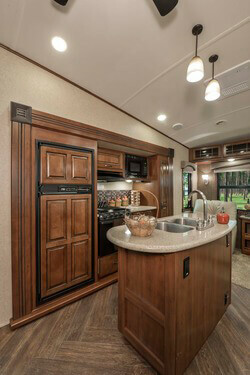 We would be happy to show our Illinois and Indiana RV customers exactly how useful this kitchen is. The bathroom comes with a Neo-Angle Shower, Medicine Cabinet with Mirror & Lights, and a Porcelain Toilet. Every Illinois and Indiana RV customer has their preference, but the following are the most beloved features that Sundance fifth wheels have to offer: Black Tank Flush System, 12V AM/FM/CD/DVD/MO3 Player with Bluetooth, 60" x 80" Queen Bed or a 70" x 80" Kind Bed (depending on the model), Spring Loaded Hidden Hinges, Night Shades, Snap Jack Pins for Landing Gear, 35,000 BTU Furnace, Dark Tinted Safety Glass Windows, and Storage in the Dinette Chairs. The bottom line is that every Sundance fifth wheel model comes with an absolute ton of features that would be hard to list on one page! Visit our Chicago area RV dealership to get the full spectrum of what the Sundance models have to offer. Please contact our Indiana and Illinois RV dealer by calling 815-933-2251 today.